I turned on the SEC Network because "Dem Boyz", my Florida Gators, were having their annual "Orange and Blue Game" on Saturday. While I was looking forward to the afternoon overall, I had my eye on a young fellow who has had an incredible spring in tight end Kyle Pitts. At first, I had to do a double-take because I thought "...is that me out there looking good?". Then I saw "Pitts" on the back of the jersey; a brother can dream can't he? There is a head-scratching resemblance between him and I. It has been a long time since the tight end position was a focal point at Florida, mainly in the passing game. This young man Pitts, a former Army All American, is going to change all that. Standing 6'6'' and 245 pounds, he is going to be a matchup nightmare for opposing defenses next year. Watching the game, I was looking for him on the line but was shocked and pleasantly surprised to see him lined up wide and on the single-receiver side. I saw Kyle do some interviews, talking about converting to more of a receiver at times and getting advice from his fellow teammates like Trent Grimes and Tyrie Cleveland about how to run the routes, just be himself and use his size and physicality when he is going up against a more athletic defensive back. What I love the most about Kyle is how fluid he is in and out of his breaks. How he can run routes like a receiver, but is built like a tight end. Honestly, that sounds so familiar. Pitts has earned his place in this offense and continues to get better at his craft. More importantly he has given Dan Mullen, Billy Gonzales and John Hevesy a reason to call plays for him. 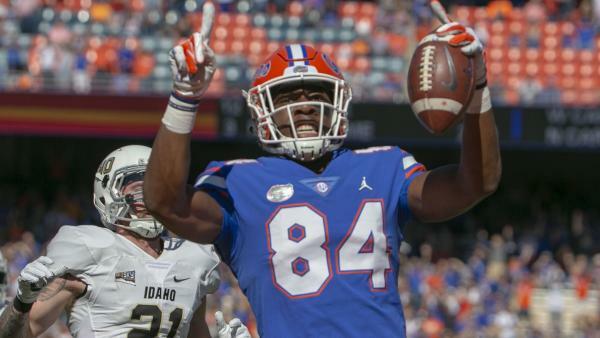 The practice fields at Florida are known as "THE PROVING GROUNDS" and, judging by what I saw during the game, Pitts has proven to the coaches that he is ready for an expanded role in his sophomore season. And he couldn't have picked a better number to sport in 84. Coach Mullen said that only ballers can wear #1 at Florida; I tend to feel the same way about #84, just keeping it real. There was once an OK tight end in Gainesville with that number who used to run around on Saturday afternoons in the Swamp and make plays. Maybe you've heard of him. Just reminiscing a little bit. The bottom line is that Kyle can be a difference-maker. He can be a game-changer. Kyle is super-athletic, he can run, he is physical. Kyle can flat-out do it all. The biggest learning curve is going to be what my biggest learning curve was back when I played: himself. By that I mean not getting complacent and just wanting to catch the ball, but also being an all-around player who is a key component in the running game as well. Being a player that influences all facets of the game while being that heart and soul of this team. Leading his teammates through his play. Kyle has it all. He can do it all. What Kyle does it make it look easy and I can't wait to watch this young man go out there and ball. I have heard nothing but great things about Kyle and finally being able to see him go make some plays had me blown away regarding his upside. Greg Nord, the tight ends coach at Florida, actually recruited me when he was the tight ends coach at Louisville way back in the early 2000s. He told me, where I was back at UF to speak to the team a couple of years ago, that when he recruits he tells future tight end prospects that he is looking for the next Ben Troupe. As humbling as that is, I think he has found him in a much taller, more athletic and gifted player in Kyle Pitts. This offense should be even better in year two under Mullen and I believe Kyle is going to have a lot to do with that. I have high expectations for Mr. Pitts. The question is: is Kyle ready for the bright lights? I think he is. There is only one way to find out. See you this fall, big-time. Rumble, young king, rumble.